My dad would allow me to blow off steam and let loose my inner maniac. I would sit in the driver’s seat of his car where I would go crazy playing at the steering wheel. The engine was always off so there was no chance I could floor the accelerator I couldn’t reach and drive through a wall. Fast forward to this year, early October. I’m walking down Hudson Street en route to my bank when I see a sight so incongruous, I almost throw out my neck: a mint condition Beatles lunchbox circa 1965 hanging off the handlebar of a stroller. It’s being pushed by a nanny tending three small fry. That happened to be the exact lunchbox I wanted when I was in first grade, but it cost more, so my mother bought me a compromise solution lunchbox featuring the Flintstones. The nanny’s charges were a tot of about two, a toddler girl around four and their big brother, a boy, I guessed was six and probably in first grade. Me: Excuse me; I remember that lunchbox in my youth. May I photograph it? Nanny: Of course! His father loves the Beatles. Everything with his daddy is the Beatles. Does Mommy use the Hope Diamond as a doorstop? So this lunchbox belonged to the little schoolboy. I thanked her for her time and moved on imagining that Daddy was at least my age, obscenely wealthy, and Mommy was a trophy twenty-five years his junior. Later I researched what a Beatles lunchbox in mint condition is worth: about a thousand dollars. There’s one on eBay priced at $6,500. I wondered what that kid’s lunchbox would look like at the end of the school year. Dented, scratched and battered? Who in their right mind would allow a six-year-old to carry his PB&J sandwiches in a collector’s item that will only increase in value over time? This isn’t yeah, yeah, yeah, but no, no, no! I ordered myself to calm down. Who am I to dictate what people do with their collector’s items? Let it go, or how about, let it be? At month’s end, I spent a weekend on the West Coast with my siblings, Dovima and Axel. 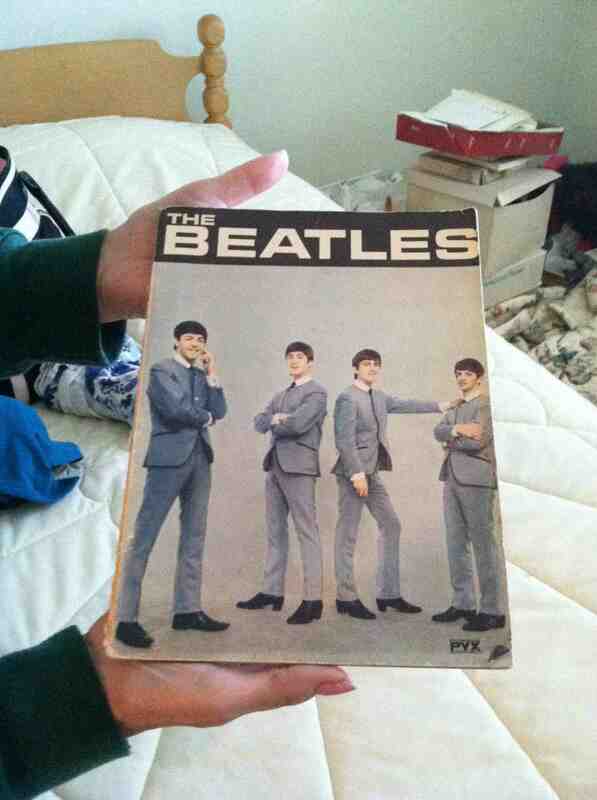 My sister lamented about how she wished she still had the Beatle fan book that she bought in 1964. Me: It’s in Dad’s house. Dovima didn’t believe me, but I assured her it was indeed there. It took us two days to dig through the entirety of our family archives, but finally, I unearthed it buried deep in a file box tucked high on a shelf that had not been opened in well over thirty years. My sister was elated. Hero-me gloated. Back in the hands of its proud owner. Me: Turn back; let’s look at it from page one. On the lower right corner of page two we saw this. Dovima was calm. I dropped multiple f-bombs. I have no recollection of when or why I wrote my name on it, but possibly it was for a school show and tell or maybe it was in frustration when my mother refused to let me set my own alarm clock or sharpen a pencil or ring the doorbell. Obviously, Mom did not keep me away from pens. I hope that that schoolboy with the Beatles lunchbox doesn’t follow my lead and do something stupid like give them all goatees. As for Dovima, when we saw that the autographed centerfold was still intact and unscathed, she breathed a sigh of relief. At least I managed to control my impulse to be the fifth Beatle, and I refrained from being the ultimate imbecile by signing my name with those of the lads from Liverpool. 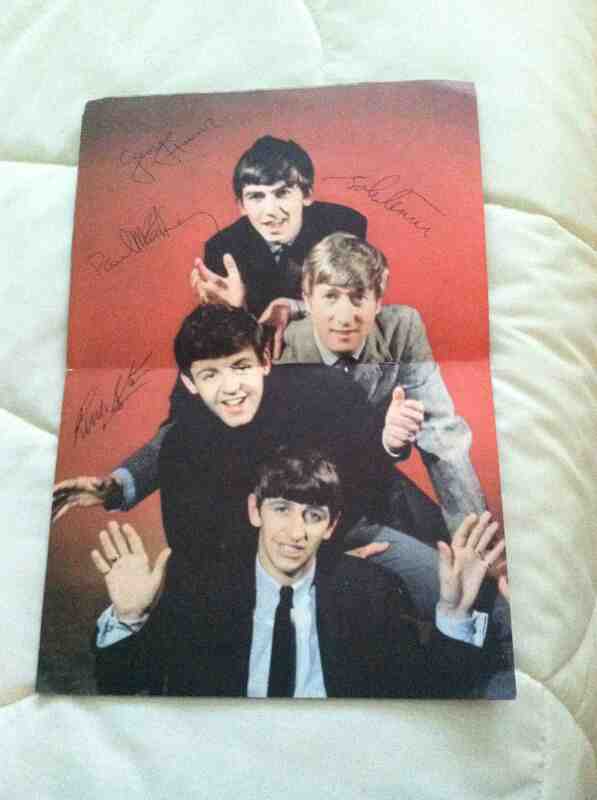 Signed John, Paul, George, Ringo and what a relief, no sign of me. This entry was posted in Humor, new york city and tagged defaced collector's item, idiocy, imbecile behavior, kids, sibling stupidity, sisters, the beatles. Bookmark the permalink. Very cool story, amazing that you knew the fan book was still at your Dad’s house. I had tons of great baseball cards when I was a kid and used them in bike spokes like everyone else did. Still had a shoebox full of untouched cards that my Mother tossed while I was at college. OY!! no idea what anything was worth, but, it sure would have been fun to go through those cards and check em out. My brother, Axel would put his baseball cards in my bike’s spoke, Lou. I loved that! Our mom ditched his baseball cards (he had so many great ones) … And my autographed Wille Mays baseball. How do these tragedies happen? Kudos on the super tracking down skillz! 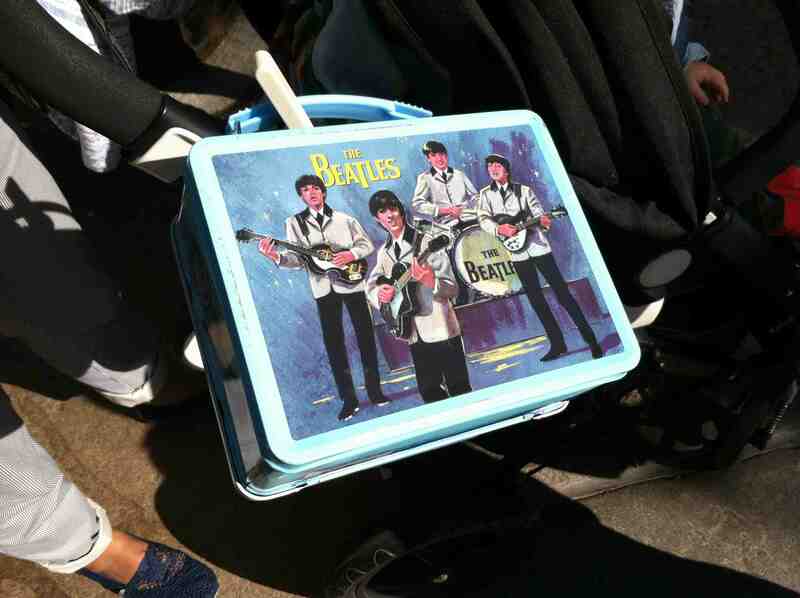 The part that irks me is about the whole lunchbox thing is that the kid probably doesn’t care about the Beatles. He probably wants the Popular Kid TV Show box and instead he’s stuck with some lousy band his dad likes. Not just that, but old fashioned style! I bet lunch boxes are different now. Lots more bells and whistles, probably connect to the internet so the 6 yo can instagram pictures of their lunch. I first thought that the little guy probably doesn’t care about the Fab Four, but maybe we’re being unfair. When I was six I was a dedicated Beatlemaniac. With his dad being such a huge fan, maybe his son is one, too? One of the best cross country flights I ever flew was in the company of a delightful six-year-old named Adelaide traveling with Travis, her nine-year-old brother. She told me that her nickname was Apple Lady. I’m not a kid person, but I had a blast with those two. Kids can be pretty cool. My fingers are crossed. May a cool lunchbox never go to waste! If that kid does love the Beatles, then I say kudos to the family for using something so precious and sharing it with the world. What good is something locked in a cabinet? Cheers to your parents keeping some personal treasures for each of you. Regarding the name, didn’t we more often sign things as a sign of ownership, thus having no idea of its potential long-term value. That’s a very sane and diplomatic outlook on my pre-adolescent stupidity, Frank. I appreciate knowing you. As for my parents, they kept an insane amount of stuff prompting Dovima to declare that we’re the offspring of hoarders. … and oh the work they left behind to do! And it’s getting done, one re-discovered vintage Beatle book at a time. Could the lunchbox be a recent repro? If so, then the tots having access is just silliness, rather than craziness. I first wondered that, too, Melanie, but when I conducted a Google search, I could not find Beatle lunchbox reproductions. But there is a Beatles lunchbox Christmas tree ornament on Amazon. I ordered one. Yes, it’s going on Dovima’s tree this year. Are those signatures in the centerfold printed, V, or were they hand-signed? I also love the “capital F” in the top left corner of your photo – harbinger of things to come! Great post! We wish those signatures were the real deal, Cathy! That would pay for Sweet Pea’s college tuition and Dovima and Herb would easily have enough left over to buy Thurber a new toy. Alas, it was just a mass printing from back in the day. Still, it’s full of cool pictures of the Beatles taken in 1963 before they crossed the pond. They’re shown living in very modest flats. Did that “capital F” resonate with me when I saw my chicken scratch! Alas! But maybe one day when Virginia Antonelli is a famous writer, it will be worth more! I had (had being a key word here, Cathy) a friend who once said that I’d probably be famous after I was dead. Let’s hope that it’s not for defacing my sister’s Beatle book! No, V, I suspect you’ll be famous in your own lifetime. And who knows: maybe that’s why that particular friend is referred to in the past tense. Unfortunately, valuable items sometimes are lost to us. I had the original prototype Kewpies doll, given to me by a family friend. Alas, my ex-husband gave it away,not knowing its history. I had been saving if for my daughter, along with a child’s size 2 china doll that had been handed down to me from my aunt who had it as a little girl. That, too, he gave away. You are lucky to have found the Beatle fan book. Lovely post. I’m also lucky I never married! Wow, those losses are painful! Thanks for sharing. I hope you still have some treasures he didn’t discard. Once I sold a mint condition Dolly Parton CD Soundtrack from the movie Rhinestone for several hundred dollars. Yes, Sylvester Stallone sings a few songs, but that didn’t seem to diminish its value. That’s a score! I bet the vinyl for the film, a musical called Paint Your Wagon that was released about 45 years ago, would fetch a good price, too. Clint Eastwood sings in that one. I remember a reviewer claiming that Dirty Harry, “Sings like a moose.” Nowadays, the moose lobby would sue for defamation of character. I wish that my defacing page two would enhance the value. I’m lucky that my sister is not the violent type. I’ve got a fix for you. Tell people that “Virginia Antonelli” is George Harrison’s birthname (he rejected it ’cause it was too ethnic & femmy). Also, other commenters may have already suggested this, but my guess would be that the lunchbox is a replica. There are some obscenely wealthy people (and a concentration of ’em on your island-fortress), but that seems over-the-top even for the Rich Kids of Instagram. Smak, what an inspired idea. Maybe from this day forward I should just sign my name “George Harrison”. My signature is atrophying quite a bit. Melanie, who commented earlier today, included a link to a replica Beatles lunch box, but it shows two lunch boxes on display. I think the replica was of the Yellow Submarine lunch box, not the blue one made in 1965 because I could not find any other replica of that 1965 era lunch box mentioned anywhere, but I did find one for the Yellow Submarine lunch box. Therefore, I think the schoolboy had the real deal. I had a little thermos which was red and from the 1950s my kids used it until it broke. I bet it was worth about $5 by then! A broken Beatles thermos is probably still worth $5 now, Susie. I have this fan book too, but one of the corners was gnawed on by a mouse at some point in the last fifty years, so I imagine it wouldn’t be worth much. I was a senior in high school when I acquired it in 1964, right when the Beatles were just becoming known here, as you mentioned. They were such a huge departure from what passed for rock and roll at that time, i.e. “Sugar Shack,” “Blue Velvet,” “Walkin’ in the Rain,” etc. It was a very exciting time! 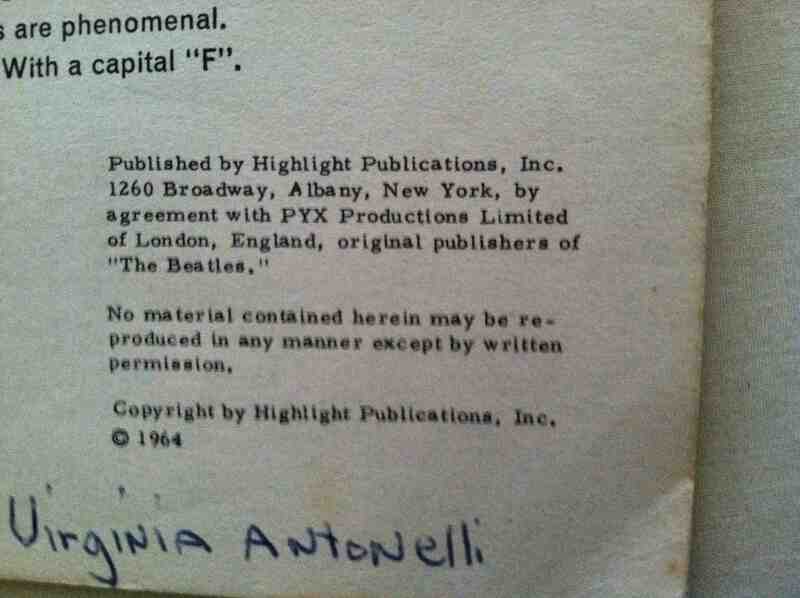 Whoa, you have the same Beatle book as Dovima, Melissa! Quick, get it to me, so I can deface yours, too. Gnawed corner, shmawed corner. Just put a nineteen cent blue Bic ballpoint pen in my hand and watch the value enter freefall. I Want to Hold Your Hand knocked Bobby Vinton’s There, I’ve Said it Again, out of Billboard’s #1 spot, where it had been taking a squat for four weeks until January 4, 1964. The Beatles were heroes. We had those, too – and we found them. When she was a kid Dovima turned the backs into playing cards. That sound you hear across country is my adult sister screaming. How cool to have such a collector’s item in your midst. It’s too bad about that lunch box, that you didn’t get one, and that the six-year-old has one and probably will put goatees on them! Kids just love to doodle and write I guess! It could be worse, Amy … I’ll get back to you when I figure out how. The odd thing is Sharlea is that that printing doesn’t look like my style of printing, even when I was a kid, but I assume I must have done that. What kid would have written another kid’s name in my sister’s Beatle book? I’m figuring that I brought it with me to show and tell and it took us almost fifty years to discover my “handiwork”. Much of my childhood shenanigans have been deleted from the hard drive in my head. Maybe that’s for the best. I wish I’d kept some of my metal lunch boxes! You’ve always been a little mischievous scrappy girl, haven’t you V? Maybe you could sell this on Ebay, you being one of the Beatles’ special groupies, so special that your name was included in this. It could happen. How’s it going? Sorry to be so late to your party. So great to hear from you Brig! I was wondering if you had slipped into the blogosphere’s black hole without goodbye. Things are going pretty well over here, possibly because I just ate a piece of chocolate. I’d like to blather that I’m a highly disciplined writing machine, but I’m just a creature of habit that keeps plugging along. It’s Dovima’s defaced Beatle book, so she’ll decide if she should coin in. I think A Certain Four-eyed Sibling squashed her chances of seeing The Big Bucks. Cut the music! I bet you also have my entire collection of lost socks. Fess up to that! I have never lied about having those socks in my top drawer. But you were not very forthcoming about absconding with them! I suppose you’ve also written my name on all of them, too. No, I signed each of those as The Beatles. I’m really inconsistent.